As my D&D group is meeting only on a monthly basis now, our weekly dedicated game night has been more focused on board and card games. I’m always looking for games that are fun on their own, but also provide bits and pieces I can use on my 4E D&D table. Due to a major discount at Amazon during the holiday sales, I decided to pick up the second edition version of Fantasy Flight’s Descent: Journeys in the Dark. Thematically very similar to classic D&D, almost all of the components in Descent are useful in 4E, providing a fantastic value even at the normal price. Tokens are a functional way to represent your monsters in 4E, but I prefer minis if at all possible. You can never have enough of them! It seems like there is always some creature you want to feature that you have no miniature for. This new version of Descent gives a serious boost to your mini choices, including no less than 38 monsters in the box. Here’s a list of the Descent monsters, with a few comments for each. Goblin archers – very useful for low level campaigns, or anytime you need humanoid minion archers. Giant spiders – common to many settings and always creepy, though they don’t look very dynamic. Zombies – overdone? Maybe. Probably my least favorite sculpt in the set, but they can represent so many types of undead they are still useful. Barghests – an odd creature, would make an acceptable fill in for wolves or other four footed predatory animals. Flesh Moulders – creepy aberrant spellcasters. Could represent diseased or Far Realm-touched humans. A bit niche for common use, though. Elementals – a mix of all four elements. Very much unlike D&D style elementals but you could make do with a little reskinning of attacks and abilities. Mirriods – my first thought was I no longer need to find hook horror minis. They are almost alien in appearance and could represent a variety of other weird monsters. Ettins – An amazing sculpt, very imposing with the armored helmets. Ignore the second head when you need a normal hill giant or ogre. Dragons – The sculpt is detailed, but the pose is a bit bland. They don’t have the distinctive look of chromatics in 4E but that doesn’t bother me too much; they’re still dragons after all! There are a couple drawbacks to the monsters in Descent. 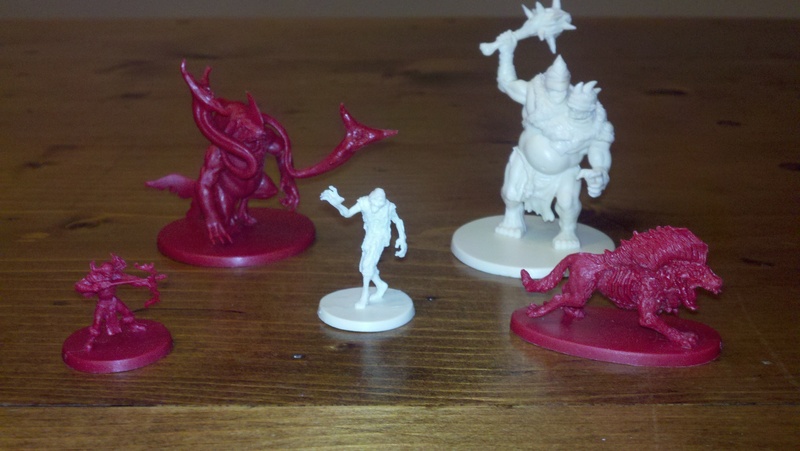 They are molded in colored plastic, similar to the Ravenloft and Ashardalon minis. Unlike the latter games, the plastic color doesn’t match the mini in any way. Ravenloft had white skeletons, for example, that look nice even unpainted. 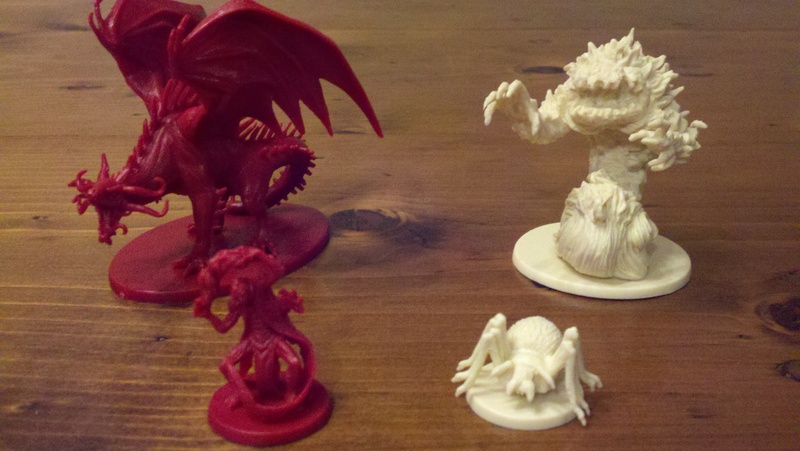 Most of the Descent minis are an off-white color, with one “master” of each set molded in red. I think even a solid-color mini is preferable to a token, but some may disagree. Another issue is the bases. Some of the minis have oval bases that don’t follow the 4E pattern of a medium, large, and huge bases being square. The wolf creatures are 1×2, and the dragons are 2×3. I’d recommend using these minis as is, regardless of the non-standard base size. If you prefer not to do so, make it clear to your players exactly how many squares these oddly sized bases take up by using a paper template underneath them. I’ve cooled off a bit on my urge to collect lots of Dungeon Tiles, preferring poster maps and those I draw by hand on Gaming Paper. Still, having access to lots of Dungeon Tiles is an advantage for any 4E DM. Descent uses the same 1 inch grid system for movement that 4E does, and includes several dozen sturdy cardboard tiles for use in encounters. Unlike the official Dungeon Tiles from Wizards, the Descent tiles interlock with one another and hold together quite well. You’ll be able to make maps quicker and without the need for poster board and sticky tack. The tiles are double sided, with an outdoor setting on one face, and a stone floor interior scene on the other. One of the neatest inclusions is a set of doors that stand up vertically in clear plastic stands. These are great for dressing up your maps. I like the Descent tiles quite a bit, and they should be especially useful for unplanned encounters due to the ease of assembly. Less obvious than the physical components of Descent, the Campaign Book can be a good source of inspiration for your campaign. It would be a bit silly to run the Descent campaign story directly, especially if you play Descent and D&D with the same group. But there’s quite a lot of fluff that you can pick and choose bit and pieces from that could fit in. I always struggle with interesting NPC names, and there are plenty to be found here. It’s a minor advantage, but still worth mentioning. There is a tremendous amount of bang for your buck when using a copy of Descent Second Edition in your 4E campaign. Dozens of monster and PC or NPC miniatures alone make it worth a purchase, and the tiles just give you that much more value. It retails for a steep $80, but can be purchased online for a significant discount. It compares very favorably to the D&D Adventure Series games like Castle Ravenloft from a components perspective. 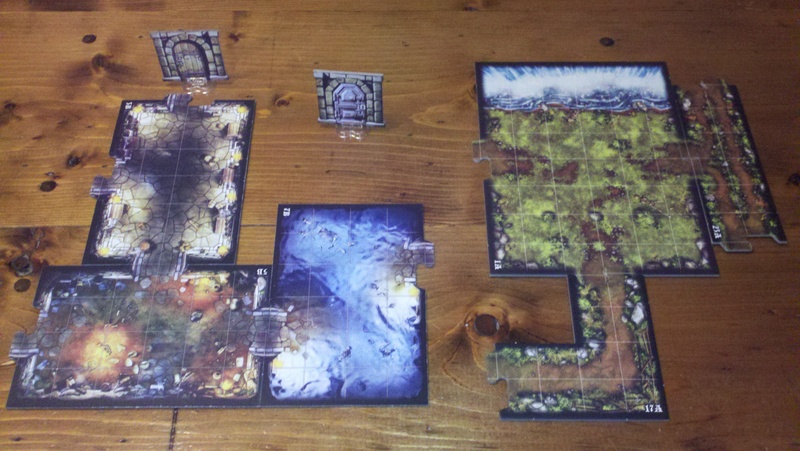 In addition, Descent is a pretty cool game on its own. I highly recommend it to any 4E DM who is looking to expand his collection of useful gaming bits. Good post and great suggestions. Over the last days I have spent some time creating a way to transform my D&D 4ed in a nice and fast-play board game. My main concern is about how to build fast random dungeons, since I am trying to play in a DM-less style, and my Descent tiles looks quite suitable for this suggestion. Hello from Brazil. Thanks for reading! 4E certainly has some baord game elements. You might look at the D&D Adventure System Games, like Castle Ravenloft and Wrath of Ashardalon. They are quite a bit like 4E and feature fast random dungeons.